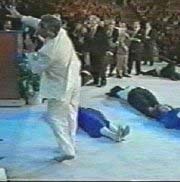 Benny Hinn is a Fake! At Benny Hinn's crusades—he dazzles the crowds, plays captivating music, and manipulates the emotions of the audience; BUT, he is not of God. What is happening is not of God. Benny Hinn is a master con artist, who fully understands the human psyche. I was watching one of Benny Hinn's crusades the other day on TV. 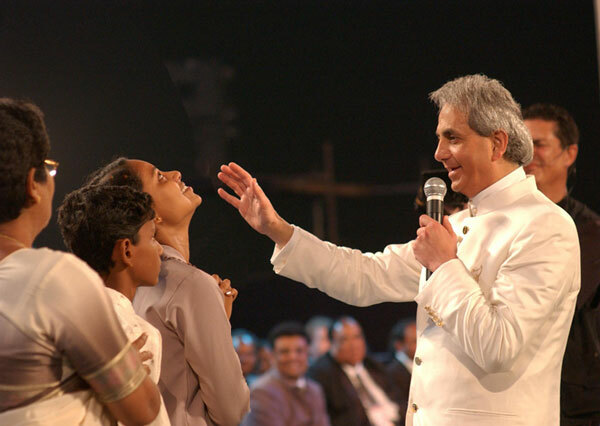 At first impression, Benny Hinn appears as a man of God. He has that curious and distinguishing look that mesmerizes the crowds. 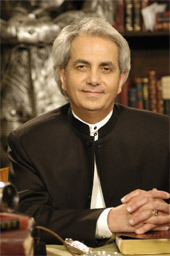 Benny Hinn comes across as an extremely interesting character, with the power to hypnotize the masses with his charm, music, and exploitation of the Bible. As I watched Benny Hinn perform on stage, it reminded me more of a rock star in concert. 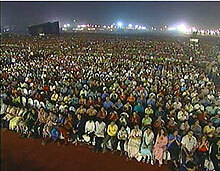 There were many thousands of people in the audience, and no doubt, millions more on TV. Just as rock-n-roll fans, the audience was in the palm of the performer, Benny Hinn. Hinn never mentioned the word "sin," never mentioned the word "Saviour," but just kept talking about how wonderful Jesus is. This is one of Satan's greatest deceptions. We read in Acts16:16-18, "And it came to pass, as we went to prayer, a certain damsel possessed with a spirit of divination met us, which brought her masters much gain by soothsaying: The same followed Paul and us, and cried, saying, These men are the servants of the most high God, which shew unto us the way of salvation. And this did she many days. But Paul, being grieved, turned and said to the spirit, I command thee in the name of Jesus Christ to come out of her. And he came out the same hour." Just as the demon possessed woman in Acts 16:17 who spoke the truth while also serving the Devil, so does Benny Hinn speak of Jesus Christ while serving the Devil. Hinn's money comes mostly from people in TV land, who are foolishly conned by what they see on TV. It couldn't be more obvious that Benny Hinn has hired a top-notch group of manipulators to work with him. One of the camera tricks which Hinn employs is to zoom in on certain audience members who look like they're having a religious experience. Seeing someone having such an uplifting experience, while hearing the emotion-producing music, and listening to Hinn ramble on with religious lingo, easily mesmerizes the viewer. As I watched Benny Hinn, he told the audience to get ready to receive the power of the Holy Spirit. Next, hundreds of people towards the front, dressed differently than the people in the back, all fell backwards to the floor. It was apparent to me that the event was staged. Then came the alleged healings. During the healing period of the crusade, several dynamic, sharp-looking, and trained people bring forth the alleged recipients of Hinn's healing power. To no surprise, as is COMMON to self-proclaimed faith-healers like Oral Roberts, ALL of the healings are unable to be substantiated. A small boy was brought up on stage, allegedly deaf in one ear since birth, but now able to hear. Another woman in a wheel-chair was wheeled up to the platform, allegedly crippled from diabetes, then she walked on stage. Another man was claimed to have been deaf in both ears from birth, but now was healed. Then Hinn prompted the man to speak in an attempt to confirm the healing, and he did speak. So when did the man learn to speak if he was deaf his whole life? I'd like to see someone with no legs receive their legs back. Why doesn't Benny Hinn ever go into a hospital and empty it out of all it's sick patients? Why only on stage, behind the camera, while asking for money? Benny Hinn ministries took in over $100,000,000 last year alone. Again, I ask, why doesn't Hinn ever use his alleged power to heal the sick people in hospitals? The reason is abundantly clear ... Hinn is a fraud. Hinn, like John Edward, Sylvia Browne, Oprah Winfrey, Joel Osteen, Rick Warren, and so many other false prophets, EXPLOITS Christianity and God's Word to gain wealth, prosperity, control, influence, and popularity. God's power is not for sale. Do you really think God would allow anyone to exploit his power on stage, for money, and to a false prophet who praises the cult of Catholicism? Satan is working relentlessly through today's false prophets to UNITE Christianity with false religion, which is APOSTASY! When Constantine declared Christianity as the official religion of Roman in 380 A.D., it led to total apostasy, and the beginning of the formal Roman Catholic cult. Don't be deceived, Benny Hinn and Billy Graham are false prophets who are leading ecumenical churches into the New World Order (the beast system of the coming Antichrist). Satan knows that the easiest way to deceive people is to obscure and blur the truth of God's Word. This is why we see so many watered-down Bibles nowadays. This is why we see Protestants praising Catholics, and Catholics protecting homosexual priests, and homosexuals twisting the Bible around to claim that Sodom and Gomorrah's sin was only a lack of hospitality. The Word of God is under attack! The Bible teaches that the gift of healing ended with the Apostles. The sign gifts were only to validate the message of the Apostles. This is evidenced by the Biblical fact that the Apostle Paul, who had once been healed of a deadly snake bite, couldn't find relief for his thorn in the flesh later in 2nd Corinthians 12:7. 2nd Timothy 4:20 also states that Paul couldn't heal his friend Trophimus, "...but Trophimus have I left at Miletum sick." Paul spoke of Timothy's "often infirmities" in 1st Timothy 5:23, but he couldn't heal his friend Timothy either. Clearly, the "gift" of healing had ceased. If you want to read an excellent in-depth Biblical examination of tongues, healing, and gifts, then please read FACE TO FACE WITH TONGUES by Pastor Max D. Younce. Benny Hinn: "Yes Lord. A lower back is being healed. Thank you Lord. he goes, miraculous healing will follow. Benny Hinn: "In the name of Jesus, I rebuke the allergies out of you. the studio today as we have been taping these TV programs." And according to Benny Hinn, it gets even more miraculous than that. this man who was raised from the dead." attracted millions of devoted followers, like Carlotta Moore. need to be renewed. I need to be revived in my spirit," says Carlotta Moore. Moore says she also watches Benny Hinn's TV show everyday. spiritual father. He's a leader. And he is a mentor." ministry revenue exceed $100 million a year. his healings and at all the money that goes into his collection buckets. studio in southern California where he now lives. scrutiny of a different kind. following him intently since 1993." Ministry. We reimbursed the foundation for its costs. see how this affluent television ministry really works. souls, we were told to stop. Buffalo, and a few cities in between. hours before the service. And so did we with our hidden cameras. disabled and those in wheelchairs. one of those people who arrive desperately ill and leave miraculously cured. host of local church choirs, and an all-star cast of Christian headliners. waiting until he comes on stage. The band is playing, "How Great Thou Art"
and then the process starts." choreographed, these people have come because they truly believe. belief or a strong want-to-belief," says Anthony, "and so they respond." building because everyone here knows what's going to happen next. tell you, you will be healed tonight!" After the preaching, there's the passing of the collection buckets. my brother George, the holy ghost is burning it out of your body!" Hinn announced God was speaking to him. Benny Hinn: "Another arthritis has been healed." healed before they get up on stage. candidate to announce her healing up on the platform with pastor Benny. moves her head around.) That is neat. Yeah, take her up there." strewn across the floor like bowling pins. So what exactly is at work here? pulled or tugged. I knew that was God touching me." to do with mass hypnosis than religion. "And they watch him on television over and over and over for years,"
place. It's a circus. It's like professional wrestling." saying he is not a healer." Bob McKeown: "It's God who heals." Bob McKeown: "He's just the vessel that's been chosen." Ole Anthony: "What's the reason that people come to the crusades? promotes himself as a healer, as a healing ministry." look particularly for those standing in front of their wheelchairs. stage and on TV, many more leave the arena still sick or disabled. up on this videotape we purchased through the ministry. God healed me, I could see better." demon had caused the cancer, and he cast it out. Benny Hinn: "Go out of her! It's gone!" One woman said she had a diseased lung. Benny Hinn: "That's why she's coughing... that's why she's coughing." says: "She had cancer in the lungs. She don't have it now!" a medical test had revealed a serious heart ailment. long, he got a clean bill of health, and won the world title back. But Benny Hinn doesn't only minister to the rich and famous. Bob McKeown: "And you needed a miracle." Belva Ventura: "Oh, did I." Bob McKeown: "You and your son." people, right next to pastor Benny. Bob McKeown: "And what did Pastor Hinn say to you?" more. And we came home, we were happy. I was healed. I know I was." we saw on his stage. Then we did some following up of our own. your cancer is still there or not." Bob McKeown: "Whether you're alive or not." Belva Ventura: "No. No. they don't." your eyes will see again!" reviewed first by a nurse, then by a doctor. Hinn said had grown a new lung right there on stage. my heart, in my lung." give you an X-ray. I want to hear about it. I want a full story." refused to provide proof of any of those healings to "Dateline." checking of our own about Las Vegas, and other reported healings. or even if she had it in the first place. Staffer: "That primary tumor can be one cell." you so much. The Lord bless you all." crusade. The cause was lung cancer. claiming credit for the champ's miraculous healing. that maybe it was misread in the first place." Hinn: "God healed him in one of our crusades, yeah." Evander Holyfield had no comment through his lawyer. t had a follow-up call from anyone in the Hinn organization. hold of me. Nobody did." Her physicians evidently were not convinced of her claims of healing. Bob McKeown: "What do your doctors say?" visit, she died. The cause, her doctor told us, was cancer. that hope, is that not a good thing?" always be exposed. It must be exposed." according to Benny, they've done something wrong," says Anthony. was from the Las Vegas crusade we were asking about. provide their medical records, and we could not speak to their doctors. he suspected she didn't have Lou Gehrig's disease in the first place. raising questions about where some of that money has gone. Chris Hinn: "One side cash, one side checks." collection money at a crusade. credits pastor Benny with curing his heart condition. Bob McKeown: "In cash, what was the biggest night you counted?" Mike Estrella: "In cash? Well, one night I counted $420,000." least $3 million a month - $36 million a year. it appears some of them pledged or gave more than $100,000 apiece last year. give to the work of God." to give money to his ministry. Hinn calls it "sowing the seed." number is on the screen." year with pastor Benny, and that she expects to be financially rewarded. reap. Now if you sow good things, you gonna reap good." woah. Thank you, Lord.' You understand?" the most successful money raisers in history." that the ministry says are inaccurate - of more than $100 million a year. Bob McKeown: "Is there any way to know how much Benny Hinn makes? Whether he's personally benefiting or not, and where the money goes?" donors more financial information than the law requires. that they raise funds with integrity," says Nelson. say he doesn't personally benefit from any of it. around the world and more importantly. Benny Hinn: "So everything you give this morning is going for souls. to do the work the Pastor Benny has been entrusted to do," says Moore. much money I make tonight,'" says Michael Cohen. bragged about his financial conquests. 'Ha, I got her last $5, guys,'" says Cohen. The ministry says the incident never happened. While that may be true and legal, it's only part of the story. thousands of the books for which Hinn apparently collects the royalties. site, and gives them away to donors. Hinn's church for God's work is just fine with her. of the gospel, I believe they should live better than even NBC's president." up all the expenses for land, construction, even property taxes. house for it's leader, is almost unprecedented. residence, parsonage, that is worth $3 million?" Paul Nelson: "I am not aware of that." Bob McKeown: "Not Billy Graham's..."
Paul Nelson: "I don't believe so. No." Bob McKeown: "...residence? Pat Robertson's?" Paul Nelson: "I don't believe so." apparently had problems finishing other special projects. City saying it would be finished "soon." that construction would be finished in, "a few short months." million healing center to be built in Texas. basically what the Lord has said to me is to wait for his voice." said he was going to spend that money on other things. get out there and preach." funds would simply be unacceptable. to spend those funds on anything else," says Nelson. accounts until the time is right. day will come I will fulfill that vision." cash taken from the collection. How much money? Mike Estrella says thousands. collection buckets was pastor Benny's righthand man, CEO Gene Polino. thing, you never have to work again.'" fifties. And I did that. And many of them went to his pockets." any money from the collections. Bob McKeown: "You categorically deny that?" not engage in any wrongdoing while employed by the church. know, we've been trying to contact you." Benny Hinn: "I'm so tired right now. I'm worn out." to do this for several months now." Benny Hinn: "I know, I've been so busy." Bob McKeown: "And we haven't had much luck with you." Benny Hinn: "No, no, no, no, hey, hey, hey, gentlemen, please." Benny Hinn: "I know, I'm sorry about that." request - it was still "no." pastor Benny about abuses in his organization, they were fired. called him an "...unstable and unreliable source." working for him, for two years, I wouldn't even take a paycheck." Bob McKeown: "Do you believe that he has healed people? " Bob McKeown: "Or that people are healed because of him?" Michael Cohen: "No. I don't. I believe that people have been healed. wields this power around likes it's his power." faith in a man they thought could bring hope and healing to millions. richer, and the poor getting worse." of others says she still believes in Benny Hinn. from heaven, in the name of Jesus!" What more information do you need? 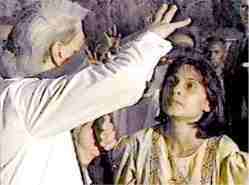 Benny Hinn is a manipulator who EXPLOITS the Gospel and Christianity.